Kolaches are a Czechoslovakian pastry. Similar to a Danish, Kolaches have a dollop of fruit filling in the middle, but with a softer, fluffier, more roll like dough. We’re not Czech, but I saw a recipe for Kolaches in a magazine in 1997 and I’ve been making them for Christmas morning ever since. This year I wanted to change things up a bit and I gave my Kolaches a fun, new shape. I saw rosette rolls on Frieda Loves Bread and thought they would be a perfect shape for Kolaches because they would hold more fruit filling. The rolls are easy to shape. If the dough doesn’t want to stretch, just let it rest for a few minutes. You can make your own filling, but Lucky Leaf sent me cans of their delicious Premium Blackberry and Cherry pie fillings. My daughter loved the blackberry, but my husband thought the cherry were even better. Between the 9 of us, we gobbled up all two dozen Kolaches before lunch. 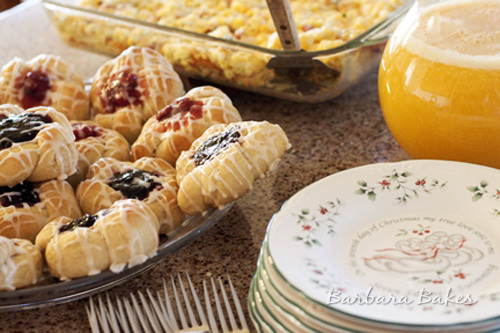 I served the Kolaches with Breakfast Hashbrown Casserole and fresh squeezed orange juice. It was a fabulous way to start the day. I hope you’re having a wonderful holiday season. For Christmas I received fun new baking gifts that I’m excited to share with you on the blog soon. Two little six cup bundt pans, donut pans, a panini maker, and 3 new cookbooks, Baking: From My Home to Yours by Dorie Greenspan, Julia Child’s Mastering the Art of French Cooking, and from my sweet adopted daugher, Lorraine, Not Quite Nigella, a fun new cookie cookbook, Chewy Gooey Crispy Crunchy Melt-in-Your-Mouth Cookies by Alice Medrich. Mix 1 1/2 cup bread flour, whole wheat pastry flour, wheat gluten, and yeast in stand mixer fitted with a beater blade. Heat milk and butter until butter melts and mixture is warm (130º). Add sugar and salt, stir until dissolved. Add liquid mixture to flour mixture. Add orange juice, egg, vanilla, and orange zest and beat at low speed until well combined. Switch to the dough hook, on speed 2 gradually add the remaining bread flour (add more or less as necessary) until dough clings to the hook and almost cleans the sides. Knead until smooth about 8 minutes, but still slightly sticky. Shape into a ball. Place in greased bowl, turn. Cover, let rise until double approximately 60–90 minutes. Punch down, let rest 10 minutes, divide dough in to 12 pieces and shape into desired shapes. Keep dough covered with a damp cloth while shaping rolls. Cover. Let rise until double (30 – 45 minutes). 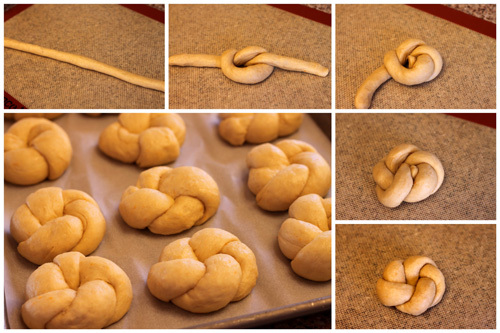 After second rising, make an indention in the center of the rolls with the end of a wooden spoon. (Be careful not to flatten it too much or poke a hole through the dough.) Fill with approximately one tablespoon of fruit filling. Optional: Make egg wash by mixing an egg white with 2 teaspoons water and lightly brushing some of it over the rolls. Bake at 400º for 10 to 15 minutes until golden brown. You could substitute whole wheat flour or just use all bread flour, or even all-purpose flour. These are gorgeous Barbara! I can see why they disappeared so quickly. Enjoy all those great gifts – can’t wait to see what you bake up! Happy New Year! 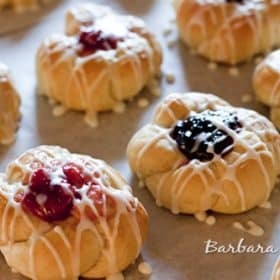 my husband LOVES kolaches but I have never seen them done like this before with these amazing fillings! I love them! The Kolaches look delicious! What a nice tradition. Happy New Year to you & your family. 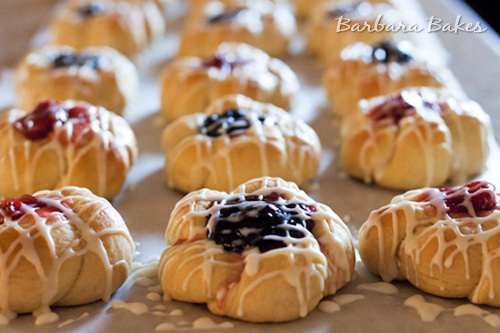 Love those Czechoslovakian pastry knots…very pretty! 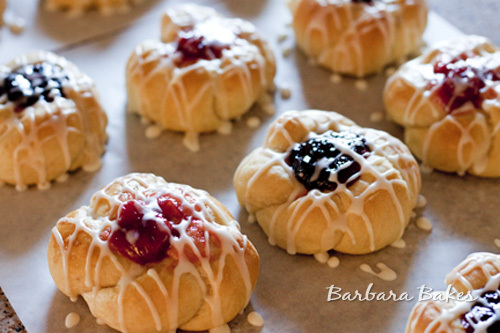 These look delicious Barbara – you make such beautiful food! I also think of the cream cheese pull apart rolls you submitted to my breakfast contest too – they were one of the best breakfasts I ever made! Merry Christmas and Happy New Year! 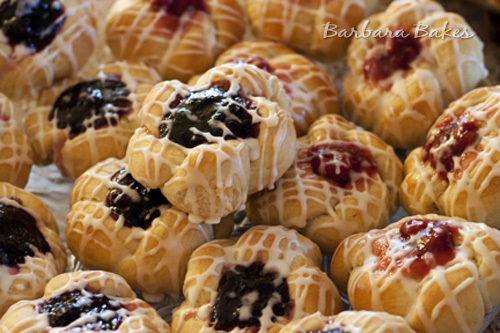 Such beautiful Kolaches that bring out the mood of joy! 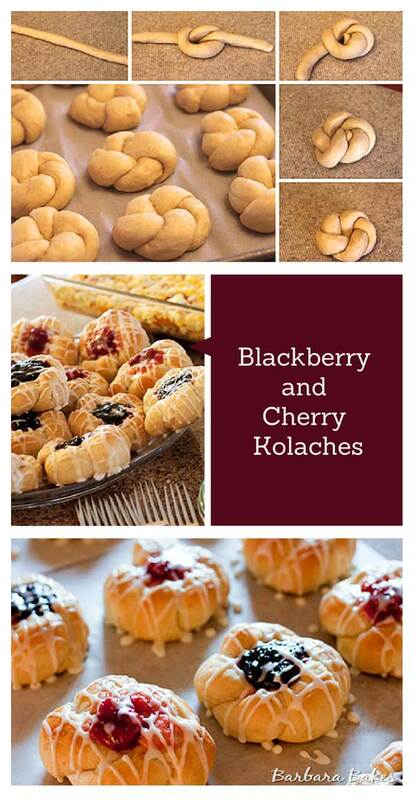 The Kolaches are a wonderful treat for the holidays! I find it fantastic that they are a part of your families food tradition, just magical. I love the shape of these. It would even be a fun way to jazz up plain dinner rolls. Yum! I love these delectables. You did make it a wee bit easier with the pie filling and have noted the flour – interesting that it helps give it some rise and often with baking I need a little extra help! What a lovely holiday you have had – all nourishment for the coming year. Happy 2012! May it bring all good things. these are just beautiful! i love food traditions like this, good memories will forever be associated with this wonderful pasty!